Absolutely Cheesy: I Know It's Been a While! But you're going to have to wait just a little longer. I have some big plans in the making, and I can't wait to reveal them to you. But it's going to have to wait. Until then please be patient with the lack of anything interesting here. Right now I'm obsessed with this tiny pot that I bought at Target for a dollar. It came with soil and strawberry seeds. 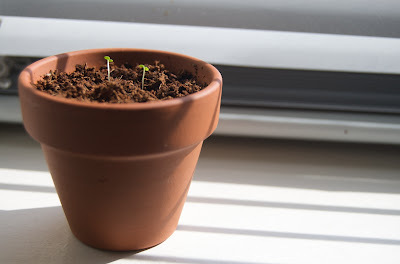 It is my very first project in growing things. My Mom and sister are fabulous gardeners. Growing up we always had fresh veggies and berries to munch on in the summer and fall. My Grandma also tended a garden, but hers was chock full of the most beautiful roses. Someday when I have a house I hope I will find the time to garden. Until then I will keep an eye on my tiny sprouts above.